Onsen … a killer way to Chillax. If you’ve spent any amount of time in Japan then you probably know all about Onsen, but for those of you who don’t here’s a little information to put you in the know. The Onsen is basically Japan’s version of the Western “spa”, except in my opinion much much better. One reason that I find the Onsen better than a Spa is that often the Onsen are located outdoors whereas Spa’s are usually located inside. Here is a picture from an Onsen that I went to in Izu last Christmas. This onsen is actually a part of a Japanese Ryokan (traditional Japanese Inn) and as you can see this onsen is outside. When an onsen is located outside it is referred to as a rotemburo. Sitting outdoors in the hot natural spring water on December 24th I contemplated the answer to the question of the meaning of life, the universe and everything. I realized the answer was 42. Not only was it a great place to sit and chillax, but there was also an amazing view down the valley to Mt. 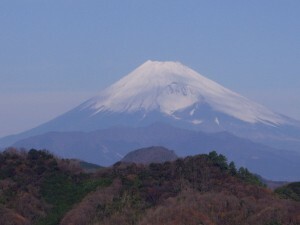 Fuji’s snow-capped peak. Because the onsen/rotemburo is located outdoors, you can get to look at some beautiful scenery that you would miss seeing if you were simply going to a Spa. I find that the view adds quite a lot to the overall experience and that all of the best onsen or ryokan that I have been to here in Japan have had amazing outdoor rotemburo. Couple of things to keep in mind if you are planning a visit for the first time to an Onsen, Ryokan or Sento (Japanese Bathhouse). First, don’t even bother trying to get in to a Sento if you have a tattoo, you will be politely (but forcefully) instructed to leave (I’m not going to get into WHY now, that will be a topic for another post later on). Onsen, especially those located at Ryokans are much more relaxed about the “No Tattoo” rule. That said, I was once told at an Onsen in Atami that I would not be allowed to use the facilities if I had a tattoo. Second, there is an etiquette to using an Onsen … follow it. Generally the Men’s and Women’s Onsen are separated (although not always) and at the entrance to the Onsen area there will be a curtained door marked for Women and another marked for Men. Push the curtain aside and open the door into the Onsen area. 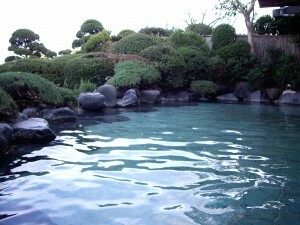 A typical Onsen area is divided into 2 or 3 parts. The first area is where you take off and store your clothes or yukata (a traditional Japanese robe). You will then go through a door into the second area which will have an indoor Onsen and a bath area with a number of small seats. Each seat is positioned in front of a hand held shower unit. Here is when the etiquette comes in. You must scrub yourself clean (using the provided soap) and make sure to get every part of the body (I recommend that you lather up and rinse two times). Third, after you have accomplished the double-wash, check to make sure you don’t have any soap still on the body. You are now free to use the indoor onsen, or you can choose to open another door to the third area which will be the outdoor onsen/rotemburo (assuming they have one). Sit in the water, look at the sky, take in the views and let the stress of the week go away. Hey,your explanation about Onsen was great. I love Onsen. It was good one in Atami wasn’t it.